The Science Council is supporting the Technicians Make it Happen (TMiH) campaign by the Gatsby Charitable Foundation, that challenges outdated notions of what technicians do and aims to inspire a generation of people to consider pursuing technical roles. From Monday 15 August you can show your support for the campaign in a couple of ways. Help raise the profile of technicians by taking pictures of what you think technicians help to make happen. These can be everyday objects or out of this world innovations – just include “Technicians Make it Happen” somewhere in the image. Read more about the competition details and watch this video for a flavour of the type of thing that is expected. 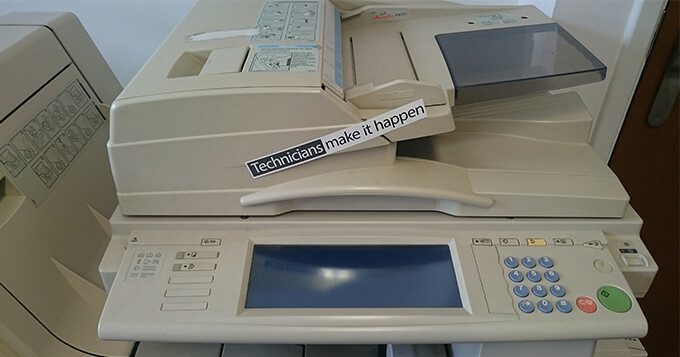 Share your images across social media tagged with #TechniciansMakeitHappen. The online competition will run across Instagram, Twitter and Facebook – in which a winner will be picked every month to receive a £25 Amazon voucher. The competition will be ongoing throughout the 2016/17 academic year and an overall winner will be announced next year, who will receive a grand prize of £1000 and career mentorship from an industry expert.